Season’s Givings Blog Hop 2015! 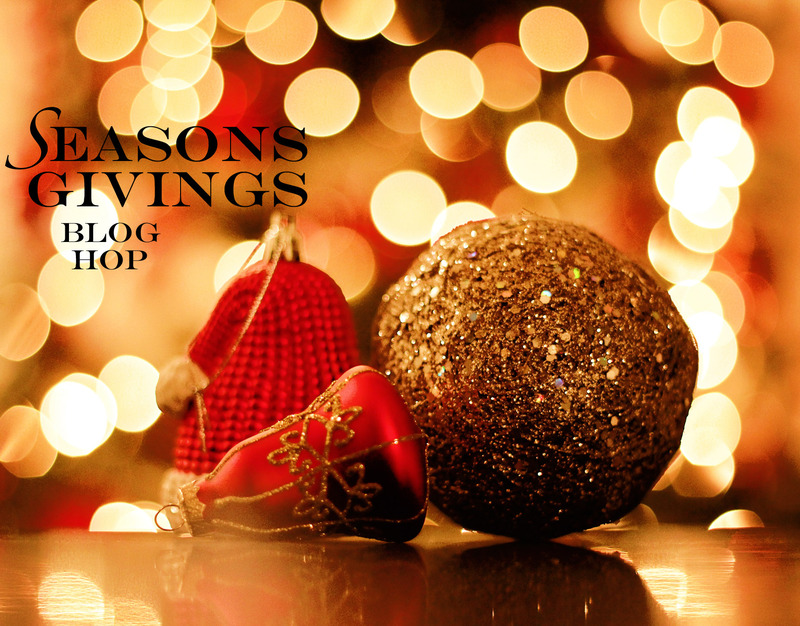 Welcome to the Season’s Givings Blog Hop and Happy 2015! I hope you are finding this year’s hop full of inspiration! Each and every blog on the list below is sponsoring their own prize, so be sure to grab a snack and a drink and enter to win some great craft swag! I have a super quick and easy card to share today. CHA preparations are in full swing, the boys are home from school and craziness rules! It’s good to sit down and work out the crazies with crafting, isn’t it? I die cut papers from the Basic Grey RSVP collection with A Jillian Vance Design dies. I stamped with the sentiment, then added Scrapbook Adhesives by 3L®’s 3D Foam Hearts. The back side of the pink die cuts have 3D Foam Squares, so there is some dimension to this card. I pulled lace through the two Ribbon Banner die cuts. The 3D Foam Hearts are embellished with pink pigment powder for a nice shimmery look. I sanded the die cuts to show off the embossing better, these dies have great detail! Here you can see the lift from the 3D Foam Squares. Easy peasy, right? Disclosure: I am on the design teams for Scrapbook Adhesives by 3L® and A Jillian Vance Design and have received products to use for blog posts. My giveaway is over $25 in Scrapbook Adhesives by 3L® products! You can also find me on Pinterest, Facebook, Instagram and Twitter! Thank You for supporting all of us designers and manufacturers! Can I take one second to plug my hubby’s app called My Markers! It’s on Google and Apple, and it keeps your inventory and shopping lists of ink pads, artist markers, pens and more organized and on your phone! No more duplicate purchases! Only $1.99! Here is the full blog hop list! Your next stop is Dina Kowal‘s Blog! Beth Pingry – You Are Here! This entry was posted in A Jillian Vance Design, Announcement, Card, MyMarkers, SCRAPBOOK ADHESIVES BY 3L and tagged a jillian vance design, Basic Grey, blog hop, Card, Clearsnap, Giveaway, May Arts Ribbon, SCRAPBOOK ADHESIVES BY 3L, Seasons Givings. Bookmark the permalink. Wonderful card…looks like craziness means creative for you!! What a cute and simple card to make! Thank you for the giveaway! Happy New Year! Crafting resolutions–I have just one really. It’s to finish projects I start and post them. I have a few that will be used this year since they miss last year’s date. I like the dimension you have on your card, and without looking bulky. 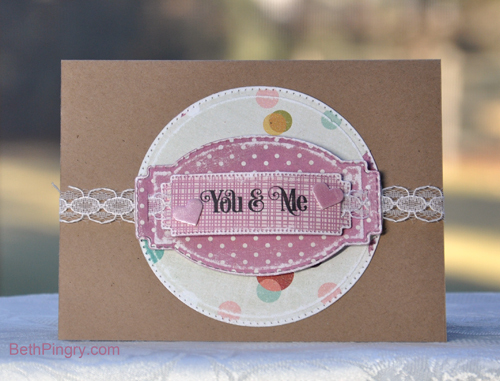 Thank you for sharing your pretty, sweet pink card and for the giveaway! I am always running out of adhesive so what a great prize! Thank you for sharing your talent and for such an awesome giveaway! Blessings to you in 2015! Thanks for the opportunity to win the giveaway! I bought the marker app. Now I just need to gather all of my markers & inks to enter them. Many thanks for your generosity and inspiration. Happy New Year!! Such a pretty card, I love dimension and I’m a big fan of pink… And I’m not even a girly girl! Thank you for offering this prize. I use the 3D foam squares a lot. Thanks for the chance to win your prize. This year I hope to finish up on a lot of projects that I have started and got side-tracked for one reason or another. Beautiful card. That lace is gorgeous. Great blog name – who doesn’t like cookies for breakfast! Happy 2015.
my resolution is to use things i’ve got on hand (NBUS) rather than buying new at the drop of a hat! LOL. btw, thx for sharing your husband’s app. sounds like just what I was looking for. Hi Beth! I love the soft colors of this card and the pigment powder is so pretty! I especially like how the 3D foam squares add beautiful dimension without the bulk. I am certainly going to check out the My Markers app. What a brilliant idea! That would be so handy! Thank you for sharing your creativity and inspiration ~ I hope 2015 is extra sweet to you! My resolution is to catch up on projects, squeeze in more crafting time, and finish some well needed storage projects. Happy New Year and thanks for participating in this hop. I love your work. I need to organize all of my crafting supplies. Just to let you know my US address is an APO address. I’m not sure if that counts or not. Have a blessed 2015. Oh, I love that sweet, sweet card! The color combo is stunning! Wishing you abundant joy and creativity in 2015! Happy New Year! great card! Love Your cards and thanks for the chance to win. My crafty resolution this year is to make lots more cards this year 🙂 Thank you SO MUCH for for the generous giveaway! Happy new year 2015! Such a pretty card! Have a Happy New Year! Happy New Year! Thanks for sharing your wonderful cards and giveaway. My new year’s resolution is to actually use the stuff that I’ve been buying. I need to spend more time crafting than shopping! Thanks for the opportunity to win and for sharing your hubby’s app! I am going to check out his app now. Sounds like something I very well need 🙂 Happy New Year! It’s my first time here and I love what I see. I will definitely be back. Gonna check out your hubby’s app, too. I have a serious problem with duplicates, lol. Thanks so much for sharing. I will definitely check out that app. Sounds wonderful! I have been a follower of your blog a long time. Thanks for sharing your talent and the chance to win! Happy New Year! Thank you for sharing your husband’s app. There have been more than a few times I have purchased a new crafting supply only to come home and find out I already had it. I will check it out today. Thank you! Thank you for the opportunity to win the adhesive package…we sure go through that stuff fast enough. Your husband’s app sounds like a good idea. How many of us have bought duplicate colors and then been upset? My new year’s resolution is to try to find more balance between family, work, crafting and everything else. Happy 2015! Love the shiny pink hearts and how you used kraft to set off the colors. Great card! Thanks for the chance! Cool card. The extra dimension is a neat effect. No harm in plugging your hubby’s app. It sounds very helpful. Thanks for the chance to win. I love Scrapbook Adhesives. Excellent products. Thank you for a chance to win a prize! I love the name of your blog! And your cards are lovely! Oh wow! The sweet softness of this design is so lovely. You really have an eye for mixing and matching! Thanks for the chance to win and for letting us know about the app! I just love the previous post’s cards!!! Love the quilt look. Anyway, my crafting resolution is to use my stamp-a-ma-jig to get my stamping perfectly lined up, and find some way of having a mini workspace at my living room chair so I can craft anytime! I really like your card. Simple but VERY CUTE!! Just the kind of card I enjoy working on once in awhile. Hope all goes well for you at CHA. I have never been there before but can imagine I would be overwhelmed by all the goodies!! Have FUN and Happy Crafting. Love the lace it’s beautiful! To do more crafting than shopping 🙂 My stash keeps growing while my finished projects have yet to catch up. Pretty card, it’s simple but lovely. Thanks for participating in the blog hop and giving us a chance to win. Happy New Year! Love your blog and great inspiration! Bethy boo-I’ve already been working on my crafting resolution in the past few months! I’ve been really active on my blog, entering challenges, trying out for DTs, which leads to actually making cards and layouts! I plan to continue that and work on de-junking the craft cave a bit more! Check in with us over @ Creative Chaos, there a still a few of us around 🙂 Love the card as well, it will be on my CAS file too! I am new to card making and excited to find many new blogs through Blog Hop. I will return. Such a fun blog hop! Your card is so sweet!! Happy New Year! Cute card! Thanks for the chance to win! My resolution is to try to keep my craft space cleaner. Wow…cute card! Thanks for an awesome prize for someone! Happy New Year!, Debbie! Lovely card, I love the touch of lace. Such great inspiration! Have a great 2015! The colors are so pretty! I love how you layered this card! My goal is to try new things. Yeah! Who doesn’t love prizes on a blog hop! Plus, it’s good to check out some of the new sites and inspiration out there. Love the colors and layers! Thanks for the chance to win some fun products! Happy 2015! Pretty Card. I’m sure your super busy with the kids. My girls go back to school Monday and to my surprise them given me time to hop. Happy New Year!! Gorgeous card Beth – HAPPY 2015 to you too! 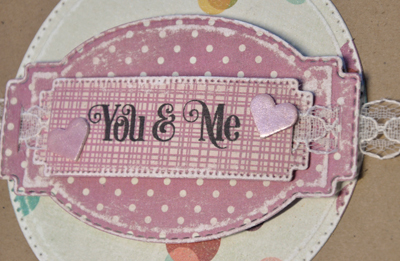 Love the soft pink patterns in your card and the distressed look! Happy 2015 and keep on crafting! Enjoying this cold winter day by hopping from blog to blog. Thanks for sharing all your beautiful creations and ideas. Use up my scraps of die cuts. Thanks for chance to win the nice prizes. Awesome giveaway and such a cute, sweet card!! Loved it!! Thanks for being a part of this blog hop!!! Very cute card, Happy new years my resolution if trying more with alcohol inks. and catching up on the layout of the kidos. Thanks for the chance. Wonderful inspiration. Great start to the new year. I love that kraft card! Great color combo! What a super prize give-away!! The app looks great. I’ll have to check it out further. Happy New Year. Thanks for the giveaway. I love your colorful tags and cards! They are really adorable and just beautiful! Thanks for sharing! love your pretty in Pink card great style! Lovely card!!! Love the soft pinks! Happy New Year!!! I’m planning to finish my collection of Distress Inks 🙂 Happy New Crafting Year! Great Card. Thanks for the inspiration. The blog hop is a great way to spend the day. Wishing new creative and crafty 2015. One of my resolutions is to send out my cards that I make. Such an awesome AJVD card…love the colors! How fun about your hubby’s phone app! That’s really cool!…happy 2015! Like your cards. I would like to create more cards in 2015. Happy Crafty Year to you. I love your card! My crafty resolution is to be more consistent in making my cards and to learn more about different techniques and to start an art journal! Thanks for the chance to win! My crafting resolution is to improve my Copic coloring and staying organized! Thank you for the chance to win. Happy New Year! I enjoyed visiting your blog witch I found through the blog hop. Thank you for giving us a chance to win awesome prizes. Thank you for sharing such a sweet card! I love the soft colors. Thank you for the opportunity to win more adhesives! You can never have too many of those! Hi Beth!! thanks for the chance to win. Happy new year!! Sweet card. I love the way you input lace on card. Finding time for crafting is always a challenge. May the new year find us more time in our schedules. lol. Happy New Year! I would love to have time to just sit and craft….uninterrupted…haha. I love the 3D foam hearts, they really emboss very nice. Love the blog hop!!! I am looking forward to learning new techniques for cards this year,,, I am new to your site,,,,I am so keeping my fingers crossed 🙂 tyvm! Here’s to a crafty 2015! Great project, perfect for Valentine’s, the next big crafting holiday! Your card is really beautiful! Love the colors! My crafty resolution is to downsize my stash to things I actually use. Happy New Year! Great ideas! Thanks for sharing! Aww . . . what a sweet card! Thanks for the chance to win a fabulous prize. I’m planning to actually finish the inside of cards when I make them so they are ready to go when I need to send them out. I’m an email follower of yours, but today I found you on bloglovin. Love this blog hop, lots of great inspiration and giveaways. Thanks for sharing and the chance to win. Enjoy the holiday chaos! Your hubby’s app sounds awesome, too. Gonna have to grab that. Happy New Year! Happy New Year! Love blog hopping. It’s great inspiration. I hope to plan ahead better this year by making my cards a month ahead so I’m not so rushed. Thanks for sharing your beautiful card. To spend more time perfecting my cardmaking and getting new ideas from the youtube tutorials and anywhere else I can get inspiration from. Love these hops. They are a great opportunity to win sample products to try in new ways. Thanks so much for the opportunity to win. Happy New Year! Cute card. Love what you did with the ribbon. Love these hops. They are a great opportunity to win sample products to try in new ways. Thanks so much for the opportunity to win. Happy New Year! Cute card! I love the way the sanding adds so much texture and the hearts look wonderful powdered up! Thanks so much for sharing! Thank you for starting my year out with some fun hopping. lovely card! good luck with CHA stuff! Happy New year! My crafting resolution is to make all the cards I send and to not have to buy any in the store. I need to get working on that! Thank you for sharing your creation and offering a wonderful prize! Happy New Year! I always love what you make. The way you used the lace really made this card special. I want to spend time this year learning how to use my new embroidery sewing machine and produce lots of great sewing items with it. my crafting resolution is to play with my copics more and my crafting buddies. Super cute card!! Happy New Year and thanks for the chance to win!! Thank you for your blog hop and giveaway! Happy New Year! Gotta organize this mess! Then I plan to catch up on some scrapbooking. This year I plan to spend more time in my craft room, finishing all the half-completed projects that are there. Your card is so cute! Thanks for the chance to win such an amazing prize! Such an adorable card! Generous Prize! Happy New Year! What a beautiful card!! I love the design!! Thanks for the chance to win and awesome giveaway!! Happy new year!! I love all the details to your card. Thanks for a chance to win. My crafting resolution is to use up my crafting supply stash! Super cute card. Great prize. Thanks for a chance to win. Happy New Year! Such a sweet card. Cute card! Thanks for sharing your projects with us all year! Your hubby’s app sounds awesome, put I still have a dumb phone! Happy pink, Happy New Year! This blog hop is amazing!!!! sweet card, Happy New Year! I love the lace on this card…beautiful. Organizing.. sounds wonderful. Happy New Year, thanks for the opportunity to win such a generous prize. I love your card, cool software from DH, just checked it out! Such a great give away….. Cute, cute card! Thanks for plugging your hubby’s app. I would love to add it my apps, but unfortunately I have a Windows phone…it looks like the app isn’t available for my phone. Hoping that he’ll add it. 🙂 Thank you! Happy New Year. Your card is cool and I look forward to the inspiration I get from you. Thanks for sharing your work with all of us…I need the inspiration! Very pretty card, I like how you used the lace. Nice card! I love Scrapbook Adhesives 3D foam squares and I appreciate all the time you put into your blog. Thanks for the opportunity and for being so generous! Happy New Year! Happy New Year! Love what you do…such an inspiration! Love the soft colors you used on your card!! Craft Resolutions…DO MORE CRAFTING!! Such a wonderful layered card! 🙂 Happy New Year! Happy 2015! Such a CUTE card! Love the uneven check print on the You & Me label. I love the pretty pinkish, purple color, thanks for sharing your inspiration and the chance to win. I apologize if I duplicate my comment, it didn’t show so I am trying again. I didn’t see anywhere in your post that it asked for a crafty resolution, but in case I missed it, mine would be to watch less YouTube and do more crafting! I am off to check out your hubby’s App, it looks like what I need to keep track of my supplies, thanks for sharing it. Happy New Year to everyone, I hope it is a great year for all of us. Happy New Year & thanks for sharing your crafty talents! Hmmm… I read the whole blog post and didn’t see where it asked about a resolution. . . Anyway if I had to pick a resolution (which I don’t do) it would be to spend less time watching YouTube videos and more time creating myself! I loved your card and am off to check out your hubby’s APP. I need something to help me keep track of my supplies and this sounds like it will be great, thanks for sharing it. Happy New Year everyone, hope it is a great one for all of us. Thanks for sharing your talent. I love my craftroom. I really need to Scrapbook pages for my kids this year. I want them to have pages of their families. My craft resolution for 2015 is to do more scrapbooking of my Girl Scout troop. I love how you threaded the lace thru the paper, such a great touch. Thank you. Beautiful card! Best wishes for the coming year! Happy New Year! thanks for the chance to win. Lovely card. Happy New Year. Thank you for the chance to win. I want to learn how to shade better. I’m horrid at that. Happy new year! I so love the foam adhesive shapes! Your husband’s app sounds fantastic! I resolve to use my tools more! Happy New Year1 My crafty resolution is to use my ” virgin” Cameo- I have it for a year and it’s in the box. I really hope to buy less and use up what I already have, which will also help to keep my craft room a little more organized- hopefully. Happy New Year. Happy New Year! I love your card :))) I have so many crafting resolutions since I’ve only been crafting for 5 months. So much to do!! 🙂 I want to learn calligraphy/improve my writing….and learn even more techniques and step out of my comfort zone when creating cards. I love this card and will definitely be casing it to send to a special friend who is hurting just now! My crafting resolution is to finish organizing my first-ever craft room and make a single card every day this year as well as a single quilt block! Tall order — I can do it!!!! Such a cute card! Happy New Year and thanks for participating in this generous giveaway! I love making scarves so I’m definitely try to work on harder patterns for the new year. my crafty resolution is to buy less and use what I already own. I definitely want to send more cards to my loved ones. Yep. To actually put photos in all my scrapbooking layouts! Organizing my craft room,it so needs it,the Hop is going to be so much fun,love all the beautiful projects and sneaks of new products! My crafting resolution is to get caught up on my scrapbooking. Happy New Year. Crafting Resolutions…. probably to spend more time crafting and less time reading about crafting online! Also to make at least some progress toward catching up my scrapbooking.